Help put the pieces back together. No other country needs T.L.C like the Philippines does right now. Its been five days since Typhoon Haiyan made landfall on coastal towns and Filipinos are in desperate need of everything. Before you unfold your wallets and unzip your purses, consider this, if you are anything like me you know giving isn’t a privilege its a necessity (firm believer in karma, do unto others…you know what I mean) and as such you want to give responsibly. So, I don’t plop down my debit card for every emergency assistance program, specifically not the one that’s always highlighted in “Red” and their contributors are “Cross” when they discover their contribution wasn’t… er..contributed to the right place. I know from whence I speak. Anyway, to help you guys out I’ve come up with a list of organizations that I know like the back of my hand will put your dollars and cents to good use. 2. World Food Program– This long storied org that is part of the United Nations has already handed out meals (rice and canned goods) to over 500,000 families in the Philippines as I write this post. 3. Mercy Corps– They have emergency teams on the ground now in Tacloban, Phillippines–the hardest hit area–to review survivor numbers, sanitation and water levels as a result of the storm. As well get badly needed supplies to survivors of the cyclone. In all seriousness, the Philippines needs as much aid as possible, so even if you are comfortable giving to the Red Cross, please do. It is desperately needed. 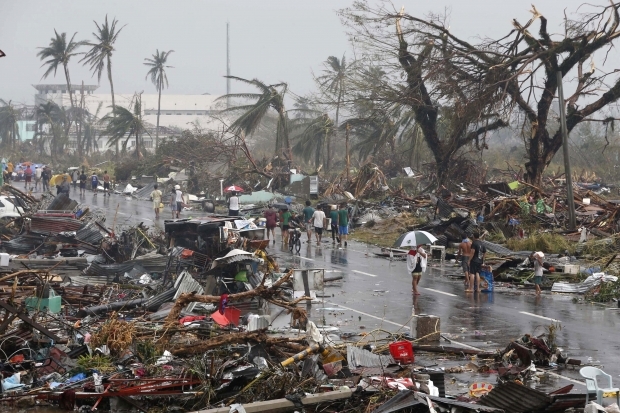 Please continue to keep the Philippines in your thoughts and prayers.